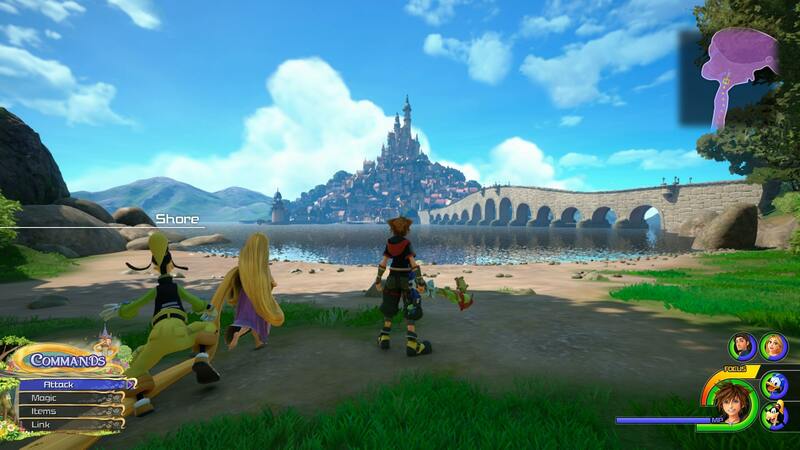 Kingdom Hearts 3 whisks its players off to 9 main hub worlds, each teeming with iconic characters and formidable enemies. 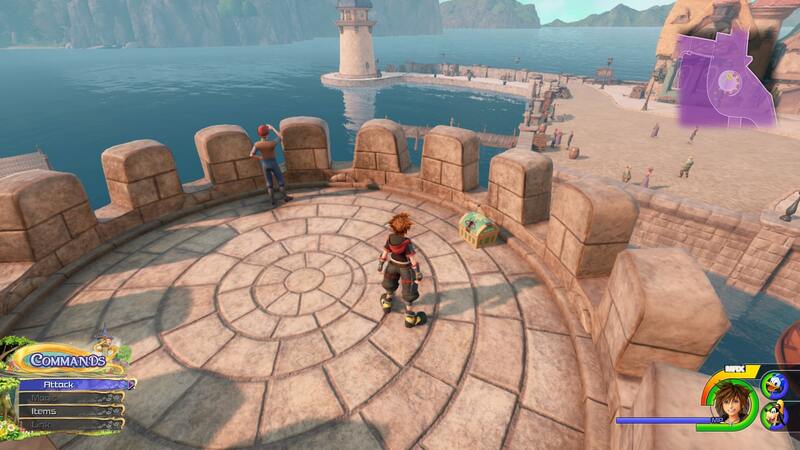 After you’ve taken on the Toy Box world, you’ll be off to the Kingdom of Corona. This is of course home to the world of Tangled, where Rapunzel sits atop her tower, waiting for Flynn Rider to rescue her. Kingdom of Corona is one of the game’s real highlights, and is, for our money, the most beautifully realized of them all. There’s a lot to see and do, and given how much backtracking there is, it can get a little confusing. 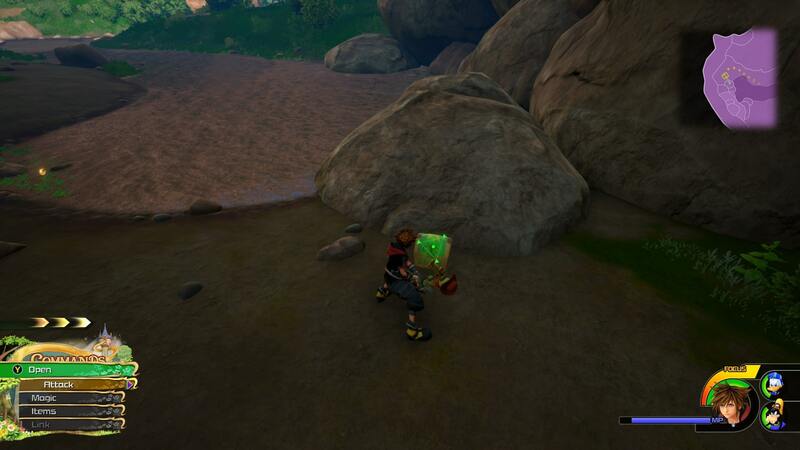 To help keep you on the right track, and to make sure you’re getting all of the chests that you can, we’ve put together this Kingdom Hearts 3 Tangled Walkthrough. We’ll be going through the stage step by step, and highlighting points of interest for you to check out. 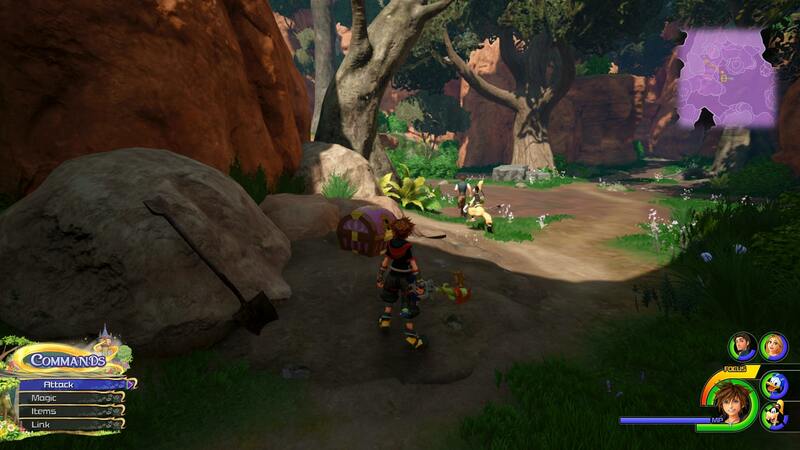 The first thing you’ll encounter in the Kingdom of Corona is a bunch of Heartless. Defeat them (fire is effective here), and then collect the pink chest that is behind them. There is a Shop and a Save Point to your left, so use those and then head down and to the right. There is another group of Heartless to take on, behind which is another chest. After the brief cutscene, turn around and head to the southeast area of the map. There is a cave containing a chest. The Chest has the Camping Out minigame. 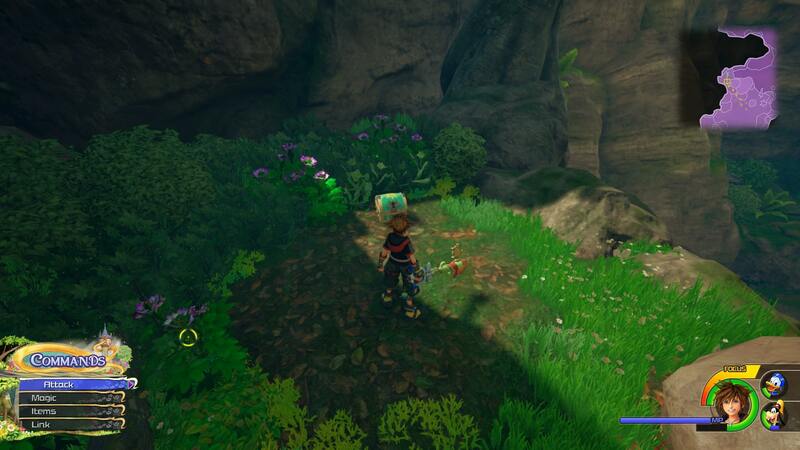 There is another chest by the pond to the Northwest of the map. Open this and then head north. 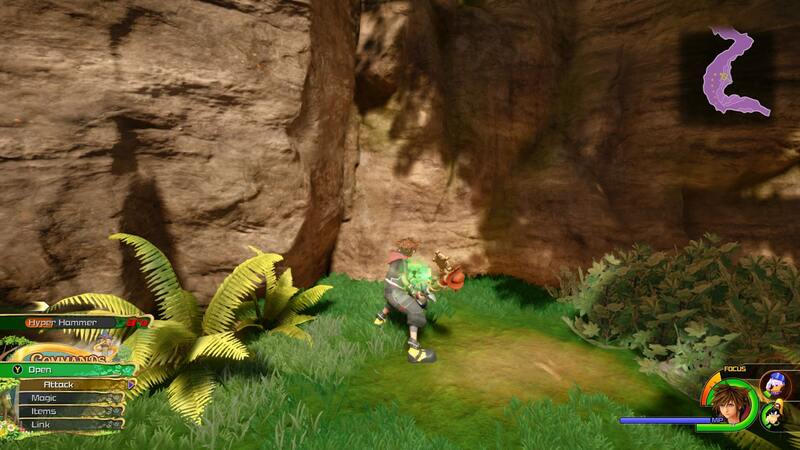 After a cutscene, you’ll need to take on a group of enemies. 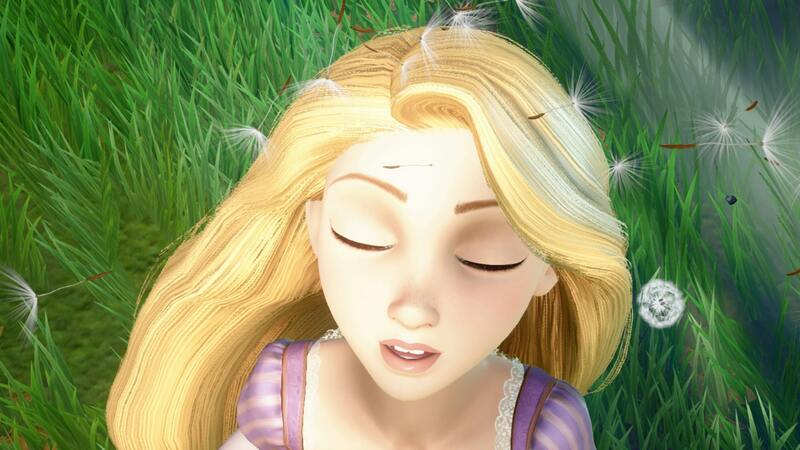 Then, Rapunzel will express interest in a patch of dandelions. What you need to do is blow them away using Aero. If you do not have aero equipped then head into your abilities menu and add it to your loadout. 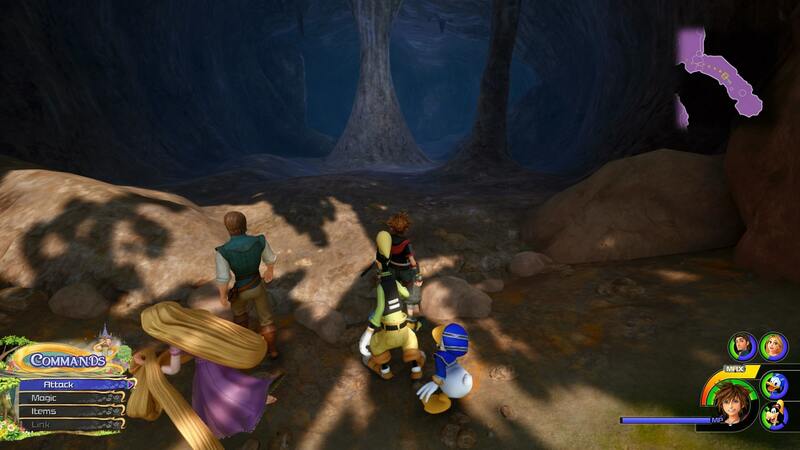 After dazzling Rapunzel with the dandelions, continue onwards until you find a group of rabbits. Follow them to a chest containing a Bronze Amulet. 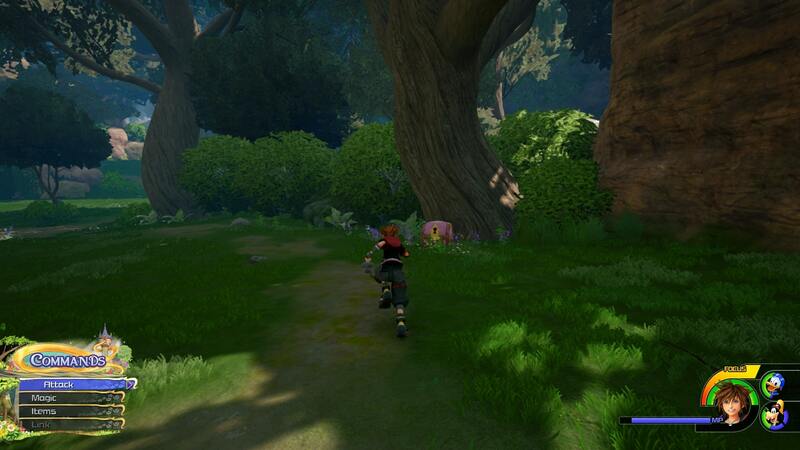 Heading North, you’ll need to fight a lot of Heartless. Use Rapunzel’s special attack as much as you can, as it is very effective here. While heading onwards, watch out for the tree branches you can warp to. The one in the image below leads to a chest. 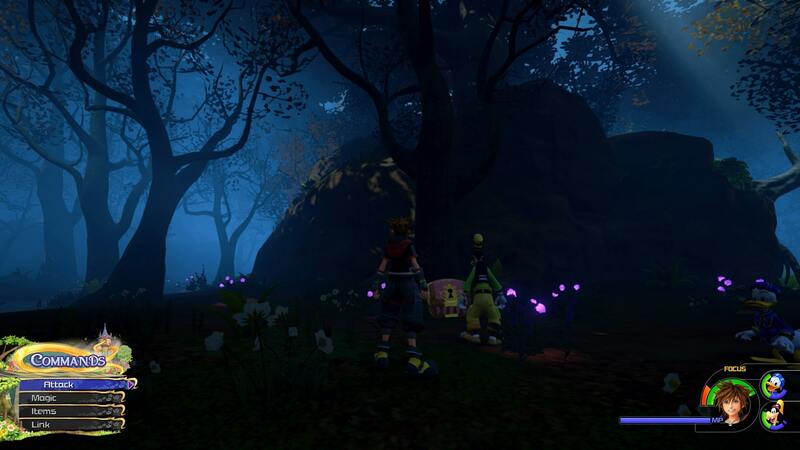 There are more Heartless to take on, and then into the dark part of the forest. 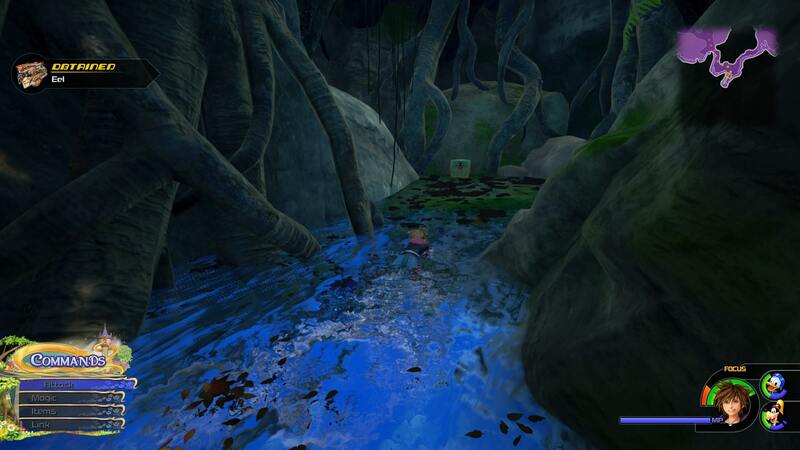 In this area there is a Save Point to your left, and a pink chest containing a Map in the center. Another Chest can be located by swimming in the area to the south. Now, go west until you reach a cave. You need to wall run up the ledge, though beware there are monkey enemies on the walls that will stop you. Continue onwards through the pass. There is a Chest to your right as you head through. Check the map in the top right corner to orient yourself. Continue forward to trigger a cutscene. There is a Save Point and a Shop ahead, and then a Chest on a hidden path to the north. 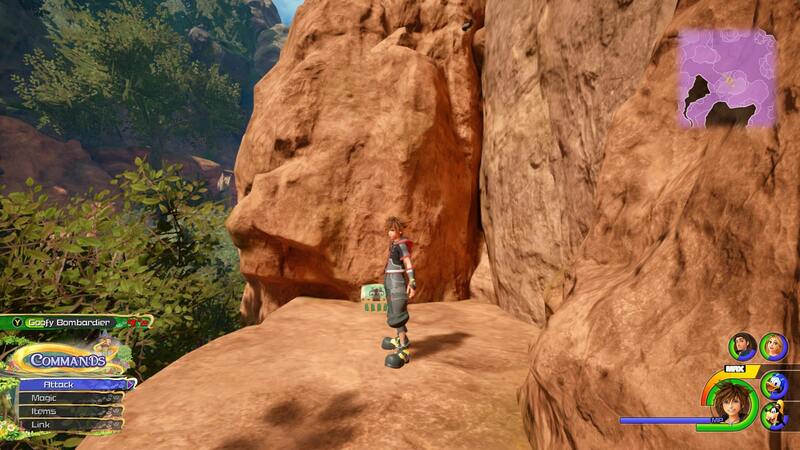 Scale the cliff ahead, and then use Rapunzel’s hair to swing across the gap. First, go around the path on the left, onwards to the second swing point. Swing across and then look for a rock to your immediate right. This is where you can head down, and then on to a Chest. Follow the path to the right and scale the cliff face. 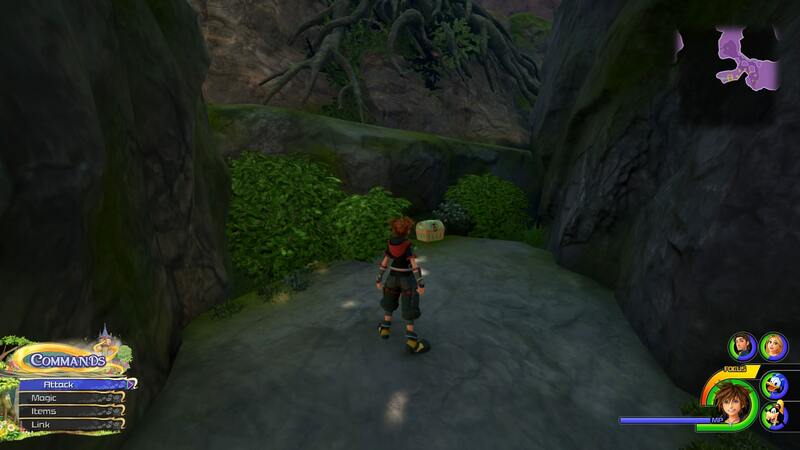 This is where you can jump off and dive attack the glowing rocks below. Doing so will reveal a Chest containing an Aero Cufflink. Head back up to the second swing point. 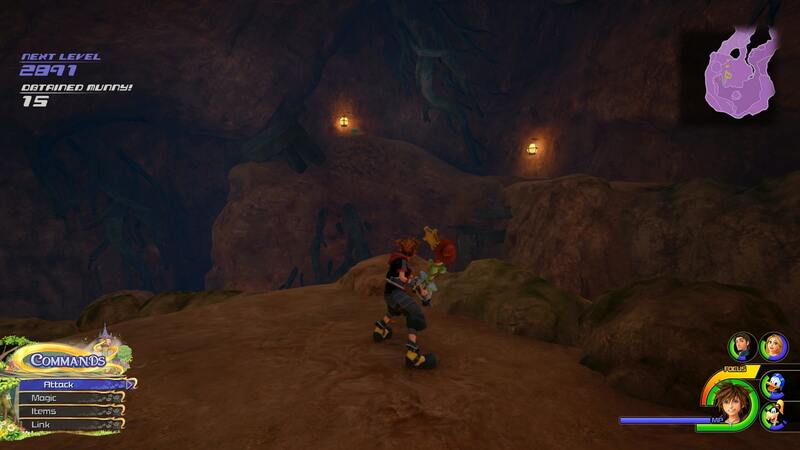 Swing across and then drop down into the cavern ahead, there are enemies here. There is a Chest up to the left, you can see it in the image above, next to one of the lanterns. Continue North and then run up the wall. Swing down and into another battle. Run up another cliff and into the clearing ahead. This area has a bird minigame. 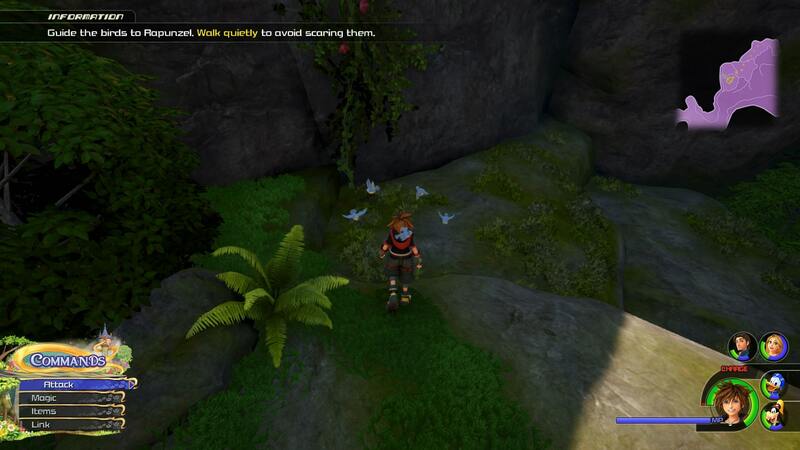 You need to sneak up on the birds to interact with them. 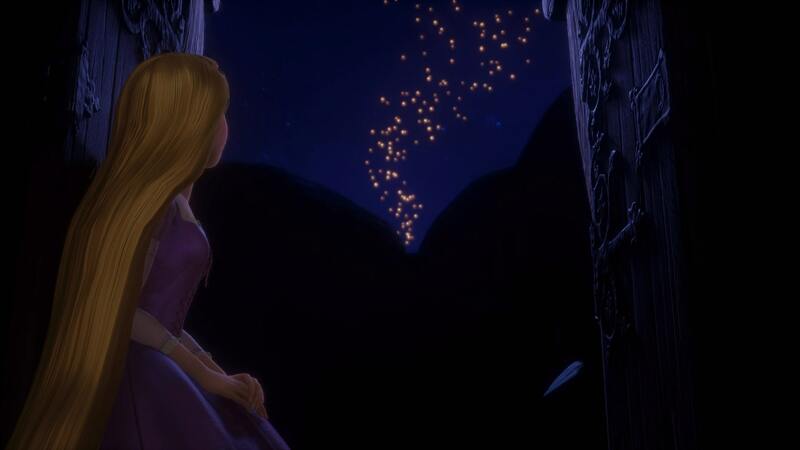 You must then slowly walk them back to Rapunzel. There is a Chest in this area, in the image above. It contains the Wayward Canary Gummiphone game. Slide down the slopes ahead to reach the Shore. From here you can see the Kingdom of Corona in all of its glory. After a cutscene you’ll be in the Kingdom. There is a Save Point and a Shop in this area. Head down the stairs on your left. There is a Chest just before you go down. 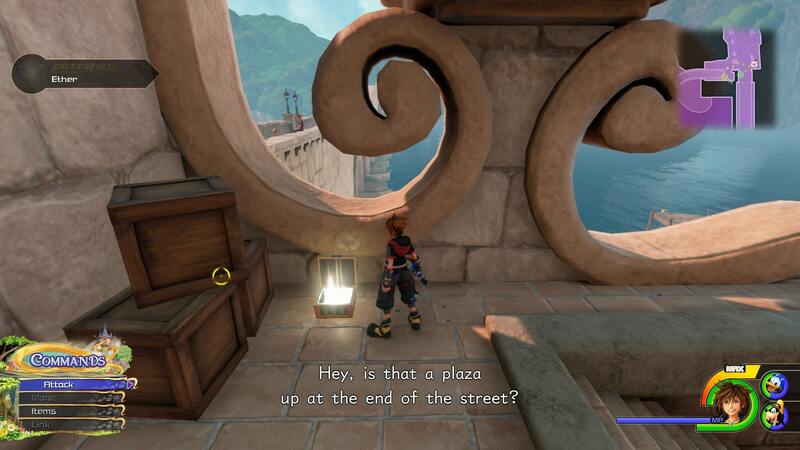 Continue further into the Plaza. There is a dance minigame to complete now. You need to press the buttons corresponding to the colors and commands on screen. 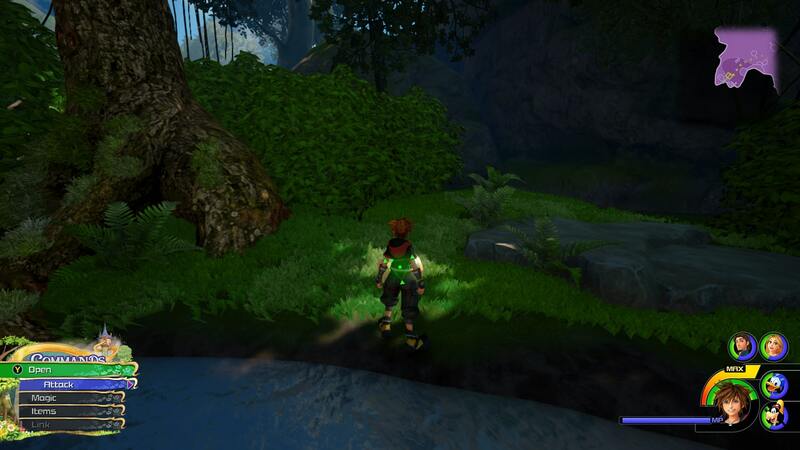 While dancing, steer Sora towards any glowing circles to continue a streak. Heading to the edges will allow you to perform on objects around you. 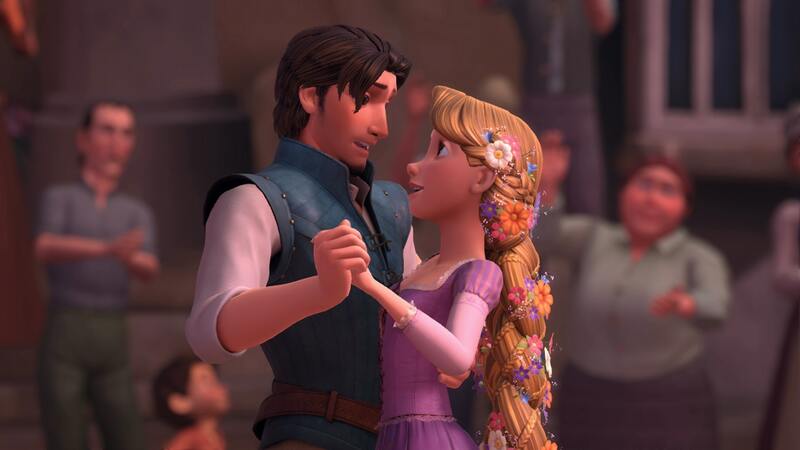 Head in to the center to dance with Rapunzel and finish the section. The final challenge is to defeat Mother Gothel. She is tricky as she builds red walls around you that damage you. There are openings in each one that you need to head through. Keep doing so in the direction of the Tower. Run up the tower to attack and trigger the boss battle proper. 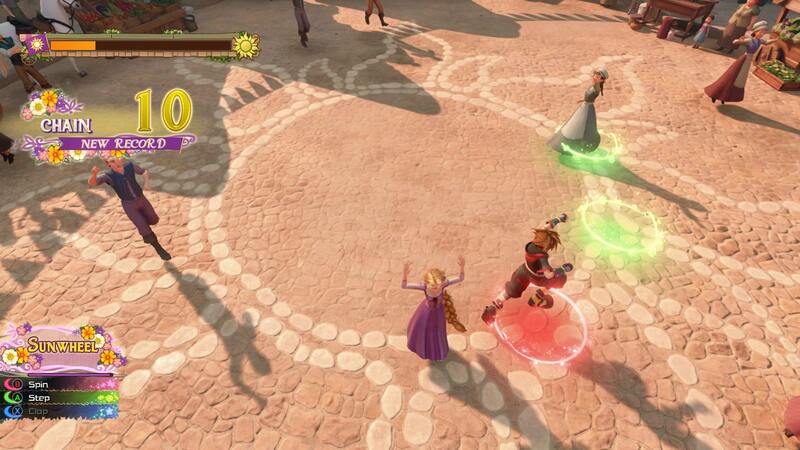 This one is pretty standard, just use aerial attacks to close in on Gothel, and then attack her with special moves. Once she’s down, there’s another cutscene, one more Heartless fight and we’re done! 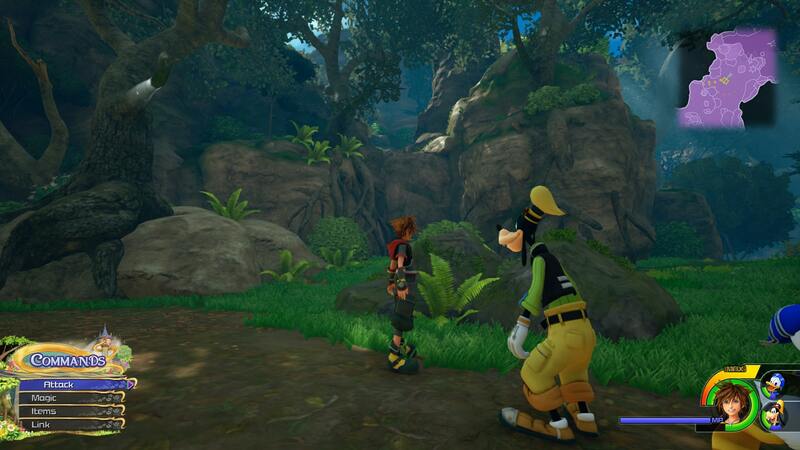 There are two maps to find in the Tangled World of Kingdom Hearts 3. The first can be found right at the beginning as you spawn in, in the pink Chest on your right. The other is in the center of the dark woods section. You can check out the walkthrough above for more info. 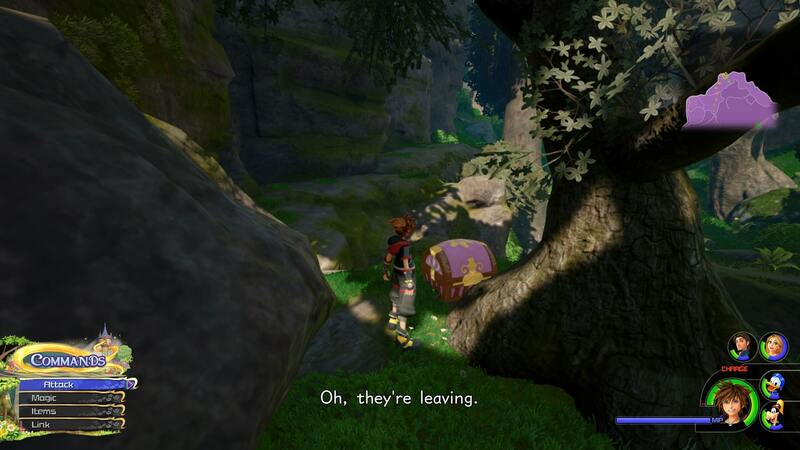 There are a bunch of Chests to find in Tangled World. We’ve outlined all of the ones we’ve found so far in the walkthrough above. We’ll be adding in more once we’ve doubled back for a second run, so stay tuned. 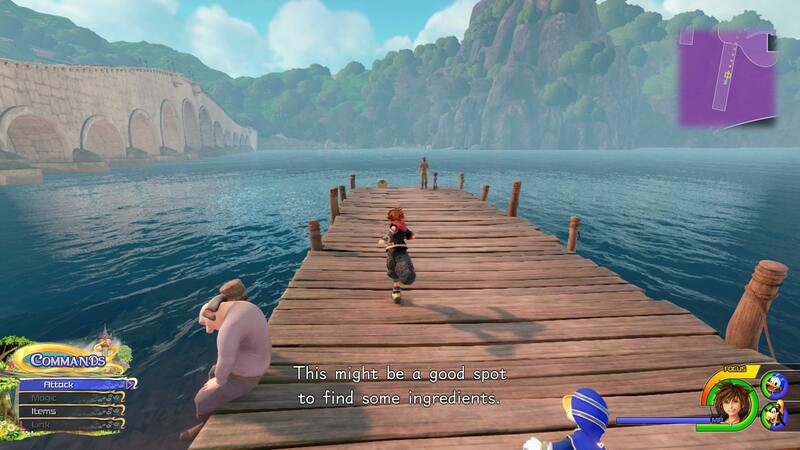 That’s everything you need to know about Kingdom of Corona in Kingdom Hearts 3. For a breakdown of all of the Lucky Emblems we’ve found so far, visit our Kingdom Hearts 3 Lucky Emblems Guide.